Uranus is the planet of change and the unexpected, and in the composite chart, he can show where you need to have constant change in the relationship, where things may not go quite the way you expect or are outright unstable, and where you need to be more flexible. With Composite Uranus in the 1st house, this can be a relationship that requires you to be on your heels constantly. You can experience a lot of changes and instability in the relationship and with the other person involved. If you can adapt and enjoy the change, you can get through it, but if you want stability, this may not be the relationship you get that from. You also need to allow one another to fully express yourselves. You may seem different in this relationship than in others. With Composite Uranus in the 2nd house, there can be some instability when it comes to your finances and resources together. In a personal relationship, you need to make sure you’re saving and being responsible, otherwise you may find you’re not in a good position all of the time. In a business relationship, this can be an excellent position for a business partnership that makes money in bursts, by commission, or in a sporadic way, as well as one focused on technology or the internet. With Composite Uranus in the 3rd house, you can find that communication between you is different than how it is with others. This can be a good thing if you’re on the same page, or a bad thing if you’re not. You may need to communication in a way with one another that you don’t have to with anyone else. This is a good position for learning together, especially focusing on subjects that are unconventional or futuristic. 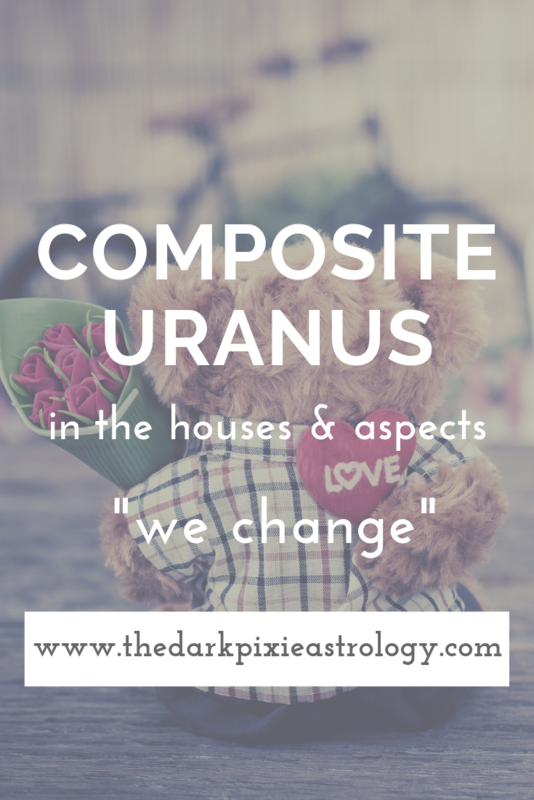 With Composite Uranus in the 4th house, this can bring some instability in the home if you live together, and you may find you move more than most people, are constantly redecorating, remodeling, or renovating, or that you prefer to live under different circumstances than most (like a in tiny house or communal living). If this is a family relationship, you may have ups and downs until you allow one another to be yourselves. With Composite Uranus in the 5th house, this can make a love relationship more exciting, but in a romantic relationship, it can come and go quickly. In a personal relationship, you need to have fun together doing things that are unconventional. This can be a good placement for a friendship that gives you each space. This house rules children, so a parent-child relationship may see one of you being extra rebellious, especially if you feel you can’t be yourselves. With Composite Uranus in the 6th house, daily life can seem unstable in this pairing, and you need to avoid a normal schedule or routine and change things up constantly. This house rules work, so it can be good for a work relationship that allows you to largely work on your own, that focuses on technology or the internet, or that is forward-thinking. You may have bursts of unexpected stresses in this partnership. With Composite Uranus in the 7th house, this is the house ruling relationships, so this can bring instability into the relationship itself, and you may view one another as erratic. You may need to have this relationship be unconventional in some way, like a long-distance relationship or open relationship, in order for it to survive romantically. Even a professional relationship may need some sort of unconventional setup to work. With Composite Uranus in the 8th house, you can experience sudden, expected transformations in this relationship, and find that you grow in different ways than you would’ve thought. In a sexual relationship, you can be more experimental with one another. In a business relationship, you may need to have an unusual way of working together. In a personal relationship, you need to avoid sudden bouts of rage. With Composite Uranus in the 9th house, you can expand and explore together in ways that you wouldn’t normally alone or with others. You can be more open to individuality and eccentricities. The issue with this placement is that you may have a hard time sticking together as you give each other a little too much space. Travel together, learn together, laugh together, and be positive together. With Composite Uranus in the 10th house, this can present a challenge since the 10th house rules stability and Uranus rules instability. Striking a balance is key with this position, and you need to be unconventionally stable and traditionally changeable (if that makes sense!). This house rules career, so in a business relationship, you may experience ups and downs together. This can be a good placement for working in technology or the internet together, or inventing and paving a different path together. With Composite Uranus in the 11th house, this is the house Uranus naturally rules, so change can be something that feels more naturally-occurring in this relationship. You can find sudden insights together, make sudden progress with your dreams together, expand your networks together, and make a difference together. You can allow each other to be yourselves, and think more about your future. With Composite Uranus in the 12th house, issues from the past can suddenly and unexpectedly become problems within the relationship. You can have sudden insights into subconscious issues, but you can also suddenly undo the relationship because of them. Try taking an unconventional approach to the relationship issues that come about. Sudden and unexpected endings may be normal in this partnership. With Composite Sun conjunct Composite Uranus, this is a relationship that likely never has a dull moment, and change is constant. You can’t resist the force of change that this relationship brings, otherwise you can feel out of control. You may seem like an unconventional pairing, or the relationship itself may be unconventional in some way. With Composite Sun sextile or trine Composite Uranus, you can be more open and honest with one another. You can feel like you don’t judge one another as much, and this allows you to be true to yourselves and be an individual in the relationship so you don’t get lost in it. With Composite Sun square or opposite Composite Uranus, this can be an unsettling relationship, chaotic at times, and it may not be very healthy for either of you. These aspects require something to ground the two of you together, otherwise you can be left perpetually spinning. With Composite Moon conjunct Composite Uranus, this can be an unstable relationship emotionally. You can each change with the wind, and it can be difficult for you to keep up with each other. It can be an exciting relationship, but you have to be able to quickly adapt to the erratic nature of it to survive. With Composite Moon sextile or trine Composite Uranus, this can be a relationship that allows each of you to be yourselves and to express yourselves emotionally in whatever way you need to. With Composite Moon square or trine Composite Uranus, you can have a great deal of challenges with the erratic emotions in this relationship. Things can be too unstable to handle, and you may have a hard time connecting emotionally, with one or both of you being quite cold. Some warmth and stability is required. With Composite Mercury conjunct Composite Uranus, this can be a relationship that opens your mind and challenges your thoughts and opinions, which can be quite positive. On the negative side, communication between you can be erratic at times, and you need more stability. With Composite Mercury sextile or trine Composite Uranus, you can each be open to the different ideas that you come up with together, and you can think outside of the box together. With Composite Mercury square or opposite Composite Uranus, your ideas may pit you against one another, and when you don’t agree, you can push back against each other hard. You may find it difficult to get on the same page. With Composite Venus conjunct Composite Uranus, the relationship can be thrilling at times but unstable. In a romantic relationship, you can come together very fast but the relationship can fall apart just as fast without something to ground and stabilize it. A personal relationship may be erratic, and a professional one may be full of ups and downs, so all relationships require grounding. With Composite Venus sextile or trine Composite Uranus, you can find the relationship and one another to be very interesting, and you each can feel you can show your affections openly. You may show your feelings in new, different ways. With Composite Venus square or opposite Composite Uranus, the relationship can be highly erratic and unstable. It can be uncomfortable to one or both of you, and while there can be a strong attraction in a romantic relationship, the energy is so erratic that it’s hard to pin down. With Composite Mars conjunct Composite Uranus, this relationship can be quite unexpected, which can be exciting but also unstable. You can each stick to your own beliefs and ideas strongly, and may push back against one another if you don’t agree in a rebellious way, so you need to be more open. With Composite Mars sextile or trine Composite Uranus, there can be a lot of changes in the relationship and of yourself, and it can be in a healthy way. With Composite Mars square or opposite Composite Uranus, the erratic energy between you can be too much to handle, and stability is desperately needed. You may feel like you’re constantly fighting, and find it exhausting. With Composite Jupiter conjunct Composite Uranus, there can be a lot of space in the relationship for each of you to do your own thing and be true to who you are as individuals, but it may be too much space if you’re not careful. You can easily float away from one another, so try to maintain a connection. This can be a beneficial aspect for you both, and you can have more success together. With Composite Jupiter sextile or trine Composite Uranus, you can be who you are and not have to wear a mask, have the freedom you desire without avoiding the other person, and feel at ease with new experiences together. With Composite Jupiter square or opposite Composite Uranus, the desire for space can keep the two of you from ever staying together. There can also be an abundance of erratic energy that makes the relationship too unstable.